American troops used vehicles styled after Russian air defence systems to regain the skills necessary to counter them - which were largely forgotten following the end of the Cold War, the Defence Blog explained. 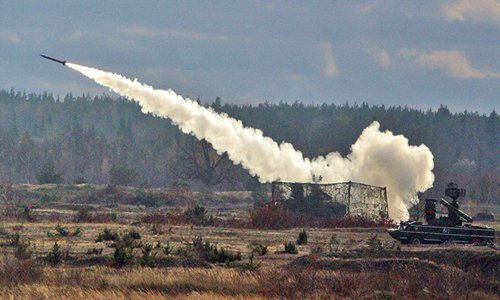 The US military has practised striking ground targets from the air during the Southern Strike drills using vehicles styled after automatic air defence systems that were developed by the USSR, but are partially used still in service in Russia — the Osa (Russian for Wasp; NATO codename: SA-8 Gecko) and Tor (Russian for Thor; NATO codename: SA-15 Gauntlet). The US AH-64 Apache was participating on the US side in the simulation, delivering a strike, according to a video published by the Defence Blog. The website reported that the US military has been renewing its skills at countering Russian weaponry, which were partially forgotten following the end of the Cold War, but which are now considered necessary due to recent tensions between Washington and Moscow. It's unclear though why the Osa air defence system mock-up was picked for the drills, as it's poorly suited to counter attack helicopters and thus not used for this purpose. Both systems were developed around 50 years ago and have been largely replaced with newer ones, such as the Pantsir S-1 and S-2 (NATO reporting name SA-22 Greyhound).